The Nevada State Athletic Commission has released the salaries for this weekend’s “UFC 116: Lesnar vs. Carwin” event at the MGM Grand Garden Arena in Las Vegas. As previously reported, UFC undisputed heavyweight champion Brock Lesnar made 10-times more than former interim title holder Shane Carwin just for showing up. The former WWE superstar pocketed a flat $400,000 payday for stepping into the Octagon on Saturday night. Despite a valiant effort and a near 1stRound victory, Carwin exits Sin City with not only his first professional blemish, but only a “whopping” $40K for co-starring in the biggest pay-per-view broadcast of 2010. The total disclosed payroll for the entire fight card was $923,000. Please keep in mind that these numbers indicate the fighter purses which are required to be reported to the NSAC. They DO NOT include pay-per-view bonuses, Fight Night bonuses, sponsorship dollars or other sources of income that fighters may receive. 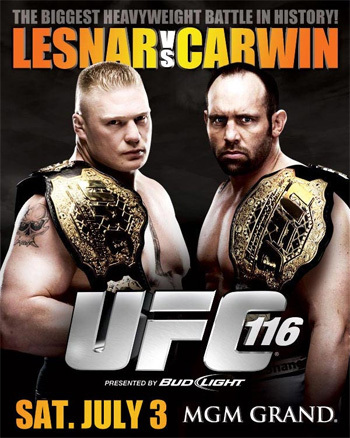 So, best believe Lesnar and Carwin (and Leben) aren’t leaving Las Vegas with just the numbers presented above.